Hanefesh President Uri Cattan from West Hartford introduces his region at the convention opening session. Behind him, l to r are: Meital Weiderhorn, Hallel Shapiro-Franklin, Hadas Bromberg-Seltzer, and Sarah Cohn. 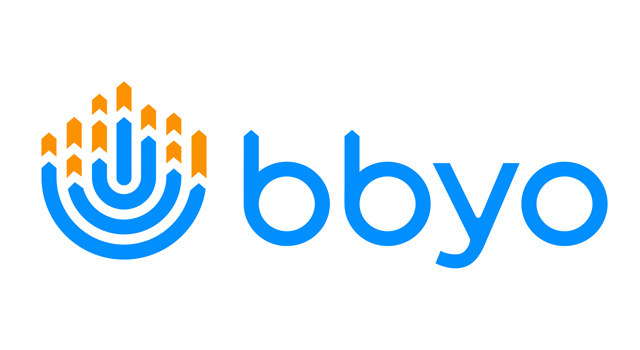 Photo credit: Seth Golob, USY. 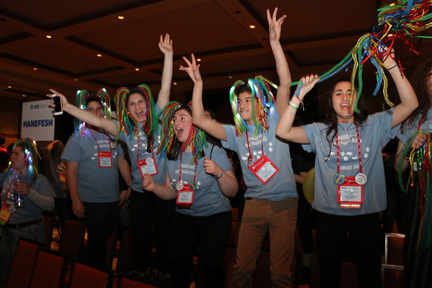 USY Connecticut teens at the convention: (l to r) Noam Benson-Tilsen, Zoe Friedman, Sarah Cohn, Evan Siegel and Meital Weiderhorn. Photo credit: Seth Golob. 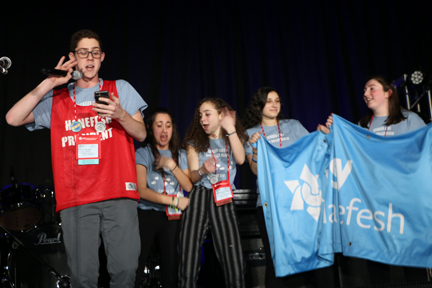 From Dec. 24-28, several Connecticut teens from Hanefesh USY region joined together with hundreds of their Jewish peers from across the globe at USY’s 67th International Convention in Chicago, Ill. The teens participated in hands-on service projects across the Chicago area on Christmas Day as well as massive celebrations and displays of regional pride during opening session. 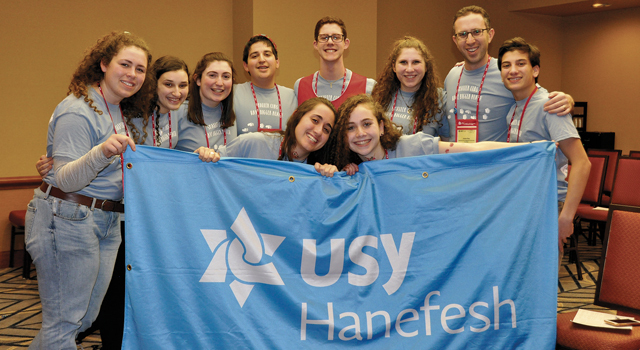 CAP: Teens from the Hanefesh USY region pose at USY’s International Convention in Chicago. Front row, l to r: Meital Weiderhorn from Westport, Hallel Shapiro-Franklin from Woodbridge; Back row, l to r: Penina Beede, staff, Hadas Bromberg-Seltzer from Northhampton, Mass., Sarah Cohn from West Hartford, Noam Benson-Tilsen from New Haven, Uri Cattan from Westport, Zoe Friedman from West Hartford, Jason Kaye, Hanefesh field engagement associate, and Evan Siegel from Westport. Photo credit: Jo-Anne Tucker Zemlak, USCJ.